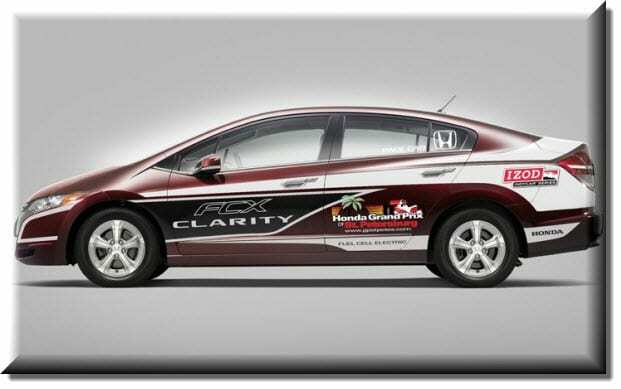 Honda has announced that their hydrogen powered FCX Clarity will be their pace car for the 2011 Honda Grand Prix of St. Petersburg, Florida. This marks the first time a hydrogen powered vehicle will be used to pace the IZOD IndyCar Series in the U.S. As the pace car, the FCX Clarity will lead competitors through a challenging waterfront circuit in the heart of downtown St. Petersburg. The FCX Clarity is currently only available on a limited retail basis in Southern California and is one of Honda’s key components in developing successful, emissions free vehicles. The car is powered by an electric engine, whose electricity is generated from a hydrogen fuel cell. Using the fuel cell, Honda has managed to make the vehicle three times more efficient than similar, gasoline powered cars. The only emissions coming from the exhaust are water and vapor. Honda has also developed their own style of fuel cell, called the V Flow Fuel Cell, which requires less space and is more durable than other models. The FCX Clarity is expected to be used as a pace care for several other races throughout the weekend after its debut. It will also participate in the annual Festival of States Parade being held on March 24 in St. Petersburg. Honda has previously used the FCX Clarity as the pace car for the 2008 Indy Japan event. The manufacturer hopes to use the vehicle in future events worldwide.